Markdown is a lightweight markup language which helps to make sentences stand out. In MLO you can style your task notes adding headings, lists, bold, italic, links, images and other elements just by typing a few characters before and after your desired text. Where to format notes in MLO? Before we drill into Markdown syntax, let's take a look at the updated sections for notes & task properties. 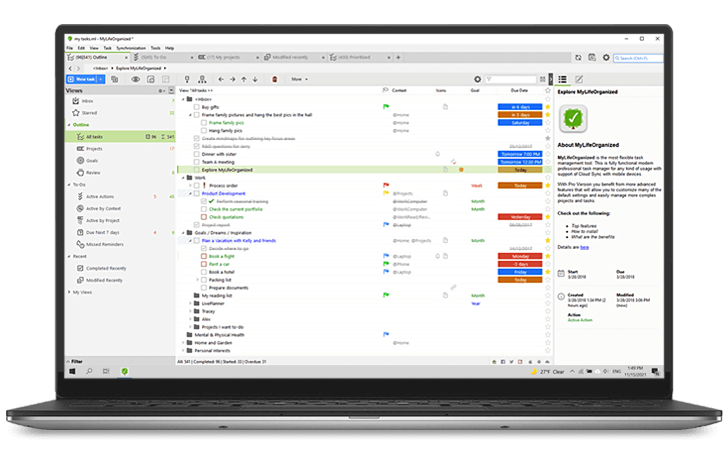 In MLO 5 there are now two sections: Task Preview and Task Editing. Here you can see formatted notes and properties that you set up for the task. Here you can manage tasks properties (edit dates, reminders, urgency and importance etc) and notes using Markdown. 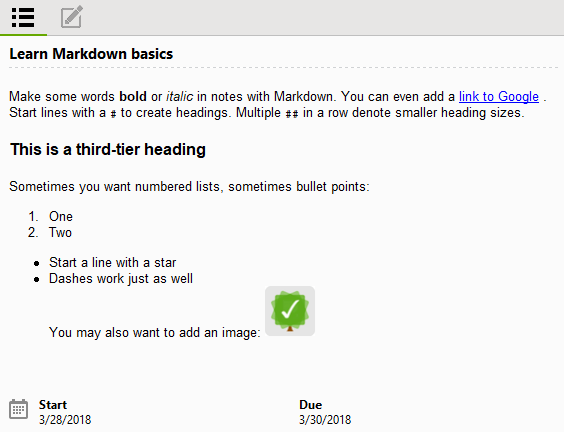 Turn on Markdown Formatting for notes. 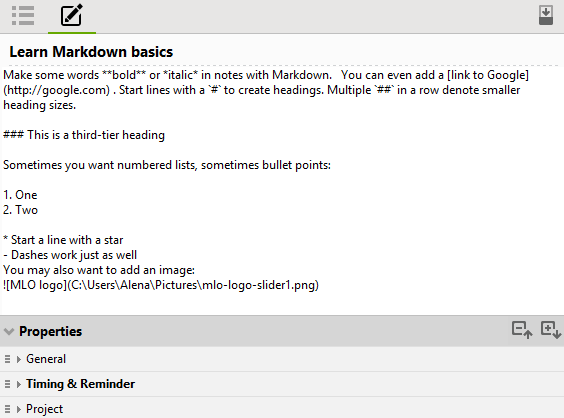 For this, go to Tools > Options > Appearance and check "Use Markdown format in notes". If you decide to turn off the option, just uncheck it in the same way. Switch from Preview to Editing mode in Task Notes and Properties Pane. Click on the corresponding icon on the pane. In the "Preview" mode click on the created note — the "Editing" mode will be automatically activated. Click on the preview icon to stop editing there. Thus, notes can be quickly edited even in the preview. Use a hotkey to toggle Preview/Editing mode. The default for this is Alt+Q (can be reassigned in MLO settings). Let's add the main elements: paragraphs and line breaks, headers, emphasis,lists, links and images. To add a line break, you need to end a line with two or more spaces, then type return. Note: Emphasis can be used in the middle of a word as well. For example, you may type in: un*frigging*believable. Tip: If you have sub points, put two spaces before the dash or star. MLO supports two types of links: reference and inline. Tip: You can also add a link to your MLO tasks there using Task ID (can be found in Advanced -> Properties for a task). Tip: Links to third party services (like Evernote, Trello, Chrome) can be added as well. Tip: If a folder name contains spaces, replace them with "%20" (see example above). Note: Gif media can be added to task notes as well. Note: Images stored locally cannot be resized with HTML in MLO and you need to resize them separately. More detailed documentation on Markdown syntax can be found on the Daring Fireball site.